Je préfère qu'ils s'occupent de la traduction des romans que du Hammer and Bolter. 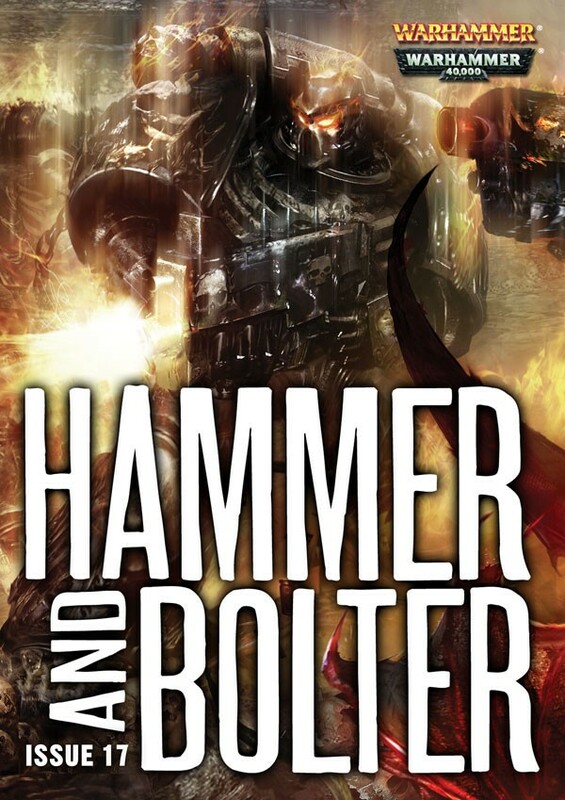 Le N°17 du magazine Hammer & Bolter est en précommande depuis quelques jours sur le site web de la Black Library. Il sera très bientôt disponible à l'achat et au DL. Illustration de cover par Jon Sullivan. 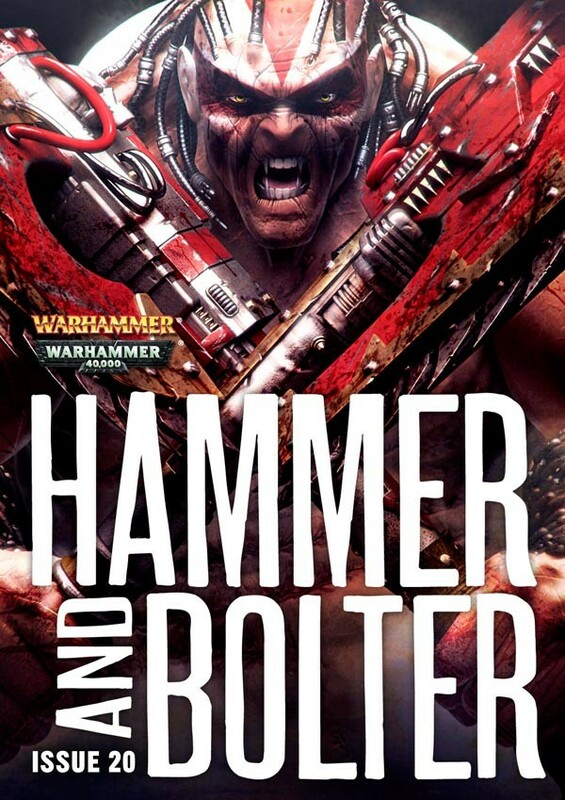 Le N°18 du magazine Hammer & Bolter est en précommande depuis hier sur le site web de la Black Library. Il sera très bientôt disponible à l'achat et au DL. * The Oberwald Ripper - There is a killer in Oberwald, and Felix Jaeger is the prime suspect. Can Gotrek Gurnisson get to the bottom of the mystery and save his companion from the hangman’s rope? The Black Library debut of Laurie Goulding. * The Lion: Part II - Lion’El Jonson and his Dark Angels battle daemons of Chaos aboard their flagship in the second part of a Horus Heresy novella by Gav Thorpe. * Gilead's Curse: Chapter V - Captured and tortured by the terrible skaven Rat King, Gilead plans makes a daring escape attempt in the latest chapter of this serialised novel from Nik Vincent and Dan Abnett. 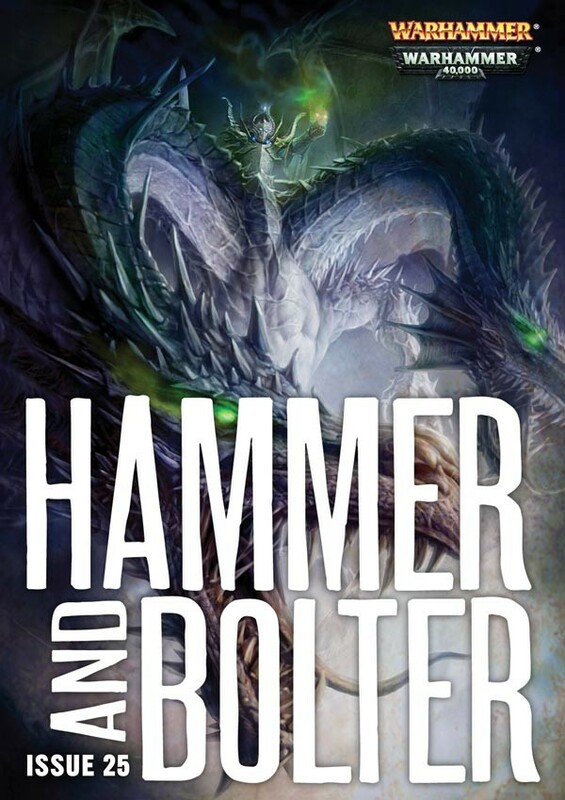 * Slayer of the Storm God - Returning to Marienburg to claim an ancient treasure, Gotrek and Felix face pirates, mutants and their greatest foe yet – a mighty avatar of the storm god, Stromfels ­– in this tale from the pen of Nathan Long. 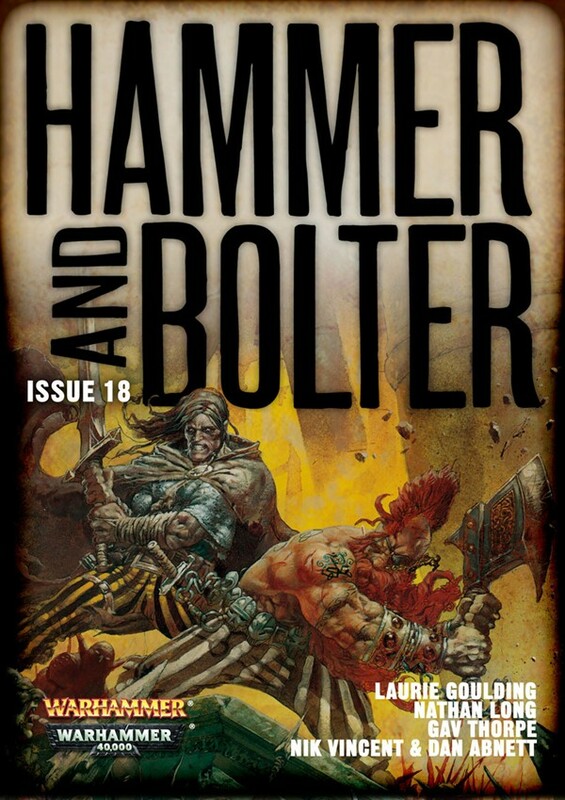 Y a pas un peu de retard pour le Hammer and bolter 18 ? C'est que j'attends la 2ème partie de la nouvelle The Lion. Je viens de relire la partie 1/3 et j'adore la transcription de son caractère qui ne peut conduire qu'à l'inéluctable destruction de Caliban. Solathen a écrit: C'est que j'attends la 2ème partie de la nouvelle The Lion. A quel moment de la chronologie se situe cette nouvelle? Solathen a écrit: Y a pas un peu de retard pour le Hammer and bolter 18 ? C'est que j'attends la 2ème partie de la nouvelle The Lion. Sans doute, il est toujours en pré-commande sur le site. Peut-être pour dans le courant de la semaine. Focus hier, de la part de la Black Library, sur le prochain N° de son magazine Hammer and Bolter maintenant en pré-commande. Explosions, space battles, giant wolves, mosterous villans and power armoured superhumans: What more could you want from a bit of light weekend reading. Well good news, all of the above appear in the latest issue of Hammer and Bolter. This month’s issue is a particularly Adeptus Astartes-heavy issue, with three stories dedicated to humanity’s finest. 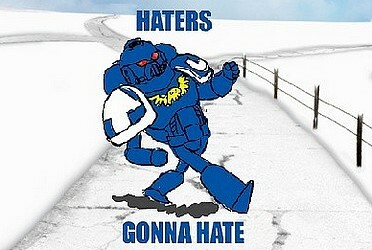 Let’s take a look at the Space Marine action inside. ‘Irixa’ by Ben Counter – Lysander of the Imperial Fists shares great battles from the Chapters history with new recruits, including a tale about a heroic figure that even the captain of the First Company looks up to (even juggernauts in golden Terminator armour need heroes). What a line up! And it’s all packed into issue 19 of Hammer and Bolter. * The Lion (Part 3): Lion El'Jonson risks open war with two other Legions as he seeks to secure a mysterious artefact that could be the key to victory in the Thramas Sector. * Irixa: Captain Lysander trains Imperial Fists recruits with tales of great battles from the Chapter's history. * Thunder From Fenris: On a world plagued by zombies, the Thunderwolf riders of the Space Wolves bring the Emperor's fury to the flesh-eating horrors. Focus hier, sur le prochain N° de son magazine Hammer and Bolter maintenant en pré-commande. * In Hrondir’s Tomb: A pack of Space Wolves accompany Inquisitor Montiyf and his acolyte, Interrogator Pranix, as they delve into an ancient tomb to learn the secrets of a long-forgotten war. * The Talon of Khorne: The last survivor of a slaughtered tribe reluctantly leads her people’s killers in pursuit of the legendary champion of the Blood God – the infamous Scylla Anfingrimm. Hammer & Bolter: Issue 20 is available to download now. This month’s issue includes the usual crop of really cool stories, but one that caught our eye in particular was ‘In Hrondir’s Tomb’, a Space Wolves story by Mark Clapham. What better way to show you just how cool this story is, than by giving you an exclusive extract to read? The Wolves ran through a city that threatened to bury them alive. Then, following Gulbrandr’s lead, they were on a steep, gravel strewn slope at an angle to the city streets, sliding down towards a weathered stone archway some distance below ground level. Anvindr dug in his heels, controlling his descent as the weight of his armoured body dragged him downwards, throwing up scree in his wake. Surrounding the archway were a few squat industrial vehicles and stacks of crates, as well as a series of crude arc lights, dull in the afternoon haze. As the Wolves reached level ground, moving from a controlled slide to a run without a stumble or pause, a blast from the railgun impacted nearby, throwing Anvindr forward. Without his power armour he would have fallen. He wore no helmet, and so closed his eyes against the blazing light and heat that scorched his skin. Still running he opened his eyes, ears ringing, just in time to see another blast consume the archway they were running under. As they ran under the archway they did so through a rain of rubble; the archway itself collapsed over them, shaken to pieces by the hammering detonations. The falling wall of shattered rock consumed them in darkness. Did he just say railgun? What are those pesky Tau up to, eh? You’ll just have to download your copy to find out. Of course, ‘In Hrondir’s Tomb’ isn’t the only story in this issue. There is ‘A Mug of Recaff’, featuring Ciaphas Cain and the ever-dependable Trooper Jurgen. For those of you who prefer your action tinged with magic and the clash of steel, there is the next chapter of Nik Vincent’s ‘Gilead’s Curse’, as well as ‘The Talon of Khorne’ and ‘Lords of the Marsh’. Join us next week on the blog where we will have a guest spot from Chris Wraight. 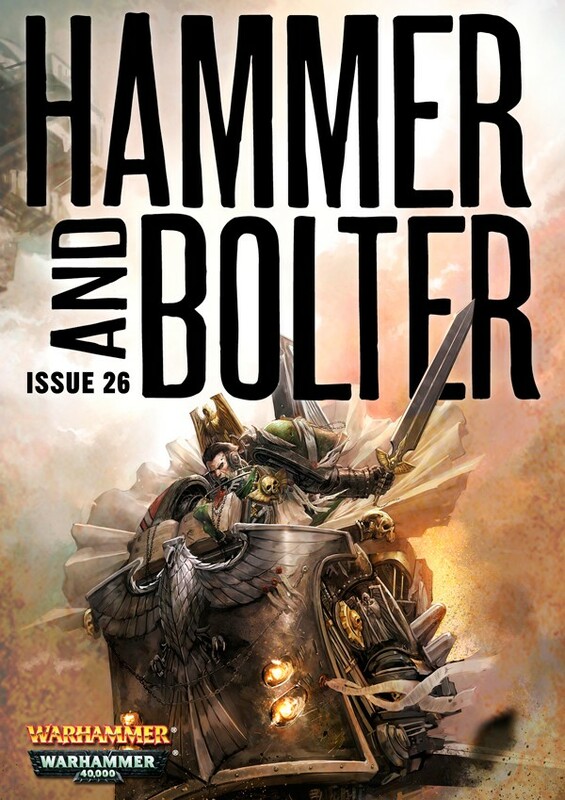 Hammer and Bolter issue 20. Source : The Black Library via FB. 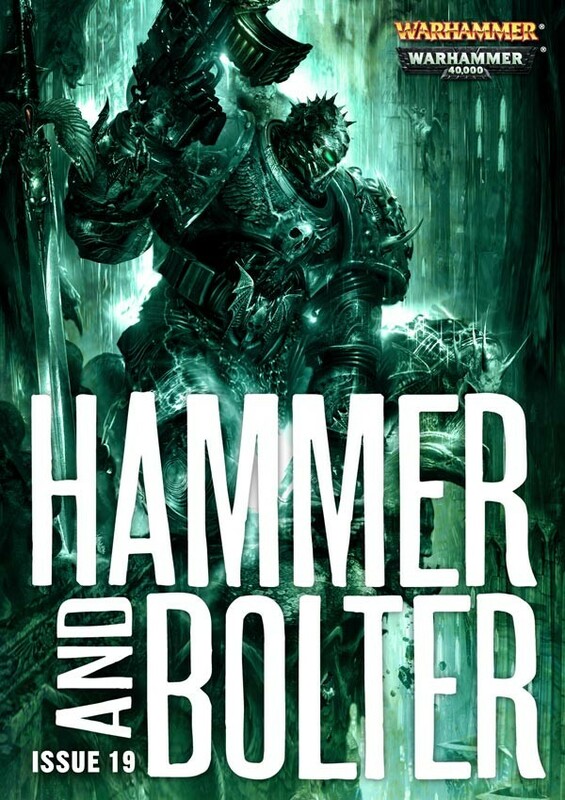 Hammer and Bolter: Issue 21 en précommande ! * Horus Heresy: Fear to Tread - Read a lengthy extract from the opening act of James Swallow's new Horus Heresy novel, and discover the origins of the curse borne by Sanguinius and the Blood Angels since their earliest days. * The Shadow of the Beast - The Scythes of the Emperor face annihilation in this brand new Warhammer 40,000 story from Laurie Goulding. Can Reclusiarch Hornindal escape the vanguard of a tyranid hive fleet and save the Chapter's home world of Sotha? * Gilead's Curse - Chapter Seven - Nik Vincent and Dan Abnett bring us the latest installment of the fantasy epic. The long-awaited confrontation with Gilead's vampiric nemesis erupts into open war, within the borders of the Empire. * Dead Man's Party - A wealthy benefactor has pledged his entire fortune to the Knightly Order of Manann, in this tale from Josh Reynolds. With assassins lurking at every corner, can Dubnitz and Van Taal keep the old duffer alive long enough to collect? * Born of Blood - Valkia the Bloody - The legend of the Gorequeen begins. In this exclusive extract from the novel by Sarah Cawkwell, witness Valkia take to the field of battle for the first time. ça me suffit pour me décider. 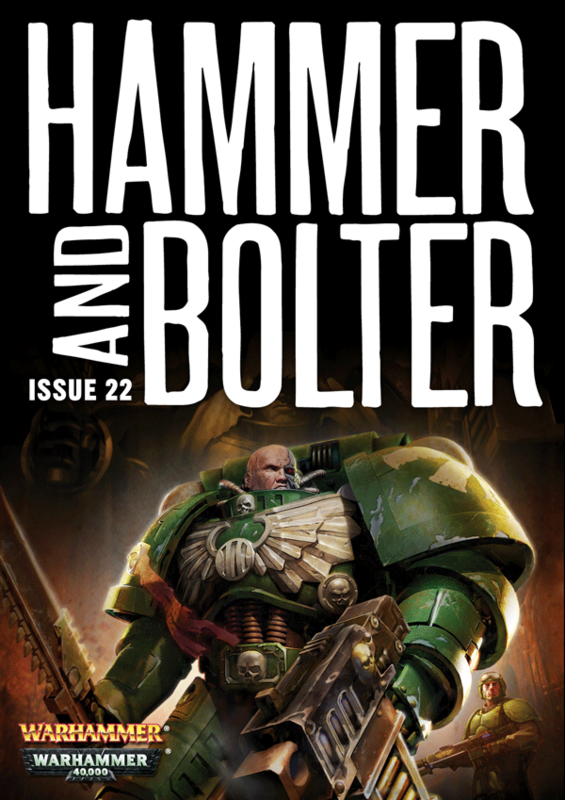 Hammer and Bolter: Issue 22 en précommande ! * The Mouth of Chaos - Chris Dows tells the story of a unit of elite Elysian drop troops as they infiltrate a rebel-held city. * The Butcher's Beast - Jordan Ellinger - Jordan Ellinger makes his Hammer and Bolter debut with ‘The Butcher's Beast’ in which a horrific monster causes chaos behind the lines for the Carroburg Greatswords. * Malediction (Audio Extract) - CZ Dunn - We bring you an exclusive extract from CZ Dunn’s audio drama Malediction, a tale of the mysterious Dark Angels and their allies in the Imperial Guard. * Fireborn - Nick Kyme - The Salamanders return to the anvil as the elite Firedrakes defend an Ecclesiarchy shrine from traitor hordes. * Leechlord - Frank Cavallo - An Imperial knight, wounded in battle against the vile skaven, encounters Festus, the dreaded servant of the plague god. 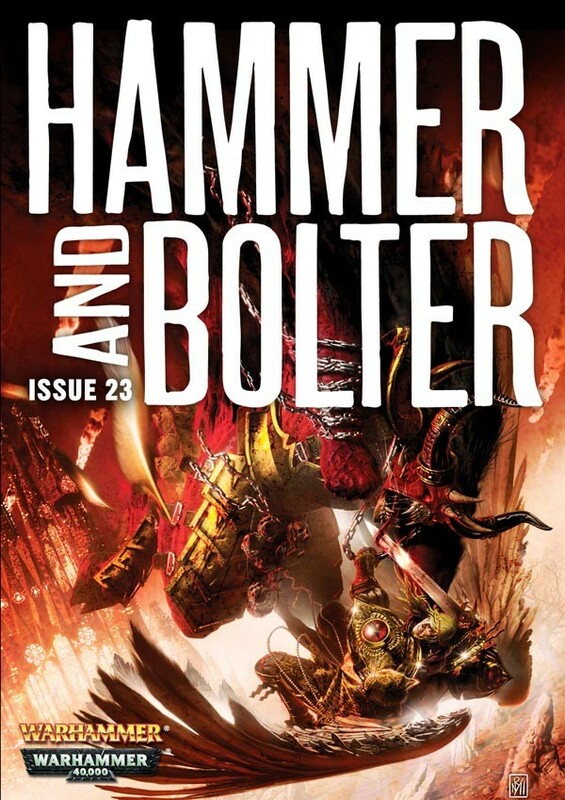 Hammer and Bolter: Issue 23 en précommande depuis quelque temps déjà, mais pas encore présenté. Cela correspond au numéro du mois d’août. 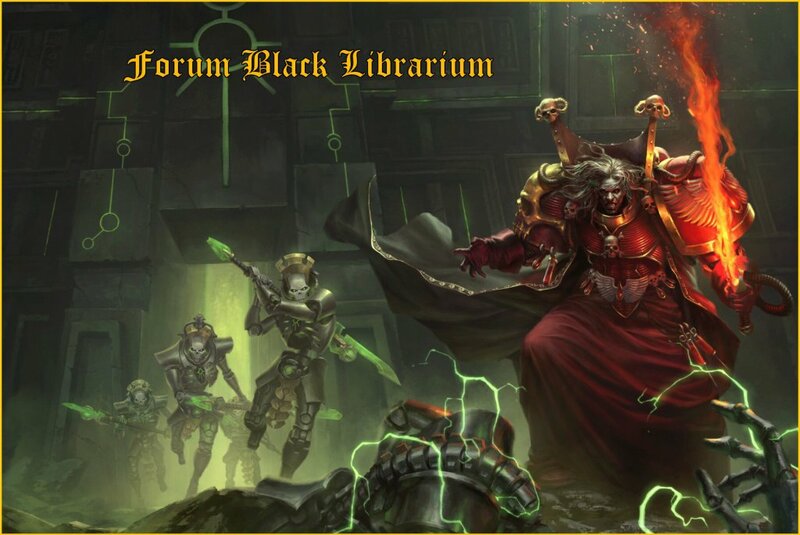 * Tyrant's Chosen - More Huron Blackheart action from Sarah Cawkwell: the most ruthless Chaos Space Marines of the Red Corsairs enter a brutal contest, to see who will emerge as the new champion of the Tyrant of Badab. * Gilead's Curse (Chapter 9) - In the latest installment from Dan Abnett and Nik Vincent, the adventures of Gilead continue. Will the insidious skaven undo all for which he has so recently fought? * Let the Great Axe Fall (Part 1) - The legend of Sigmar is far from over! Joining forces with the dwarfs led by Alaric the Mad, the first emperor encounters Krell - resurrected Chaos champion and lieutenant of Nagash himself. The first of a two-part story from Graham McNeill. * Necessary Evil - Inquisitor Czevak returns in this short story from Rob Sanders. Wandering the webway with the mysterious Atlas Infernal, he uncovers a grim secret in the colony of Perdition's Landing, deep within the Eye of Terror. * Let the Great Axe Fall (Part 2): Graham McNeill's latest tale of the man-god Sigmar concludes as the Emperor and his dwarf allies take on the might of Krell on the shores of Glacier Lake. 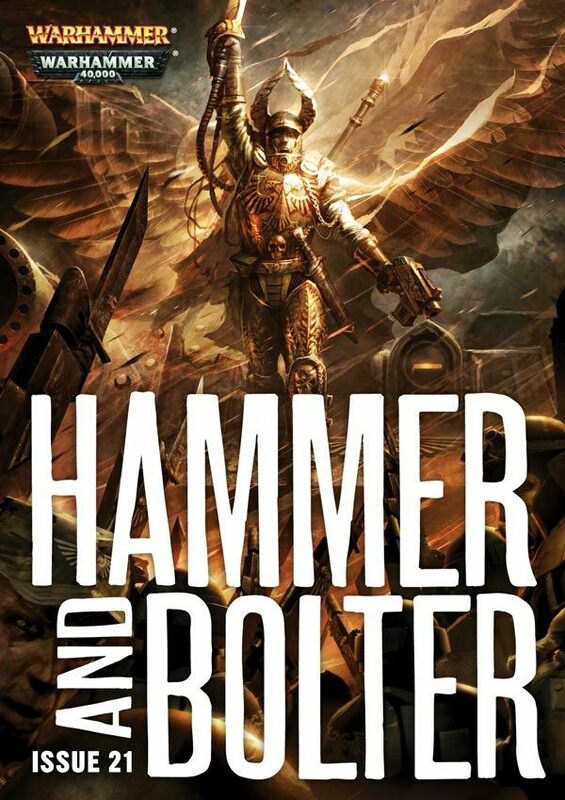 * Angel Exterminatus Extract: An exclusive extended extract from Graham McNeill's next Horus Heresy novel sees old scores being settled when the might of Pertruabo's IV Legion - the Iron Warriors - lay siege to a fortress defended by the Imperial Fists. * Gilead's Blood (Chapter 10): With the aid of the mad scholar Mondelblatt, Gilead and Fithvael discover the secret of the sands and their true enemy reveals himself in the tenth chapter of the serialised novel by Dan Abnett and Nik Vincent. * In 'The Rite of Holos' by Guy Haley, the fearsome Space Marines of the Blood Drinkers Chapter come to the aid of a world consumed by rebellion. While the beleaguered human defenders are grateful for the assistance, what is the real reason for this unexpected intervention? Je me rends compte que j'ai zappé la présentation du N°25 alors N°26 est en précommande maintenant. Gilead’s Curse reaches its penultimate chapter, the future king of Bretonnia meets his goddess and some much-loved characters return: Rogue Trader Brielle, Zavant Konniger… and Alizebeth Bequin. - Gilead’s Curse Chapter 11: An army of the dead marches on Nuln and only Gilead and his allies can stand against it in the penultimate instalment of the serialised novel by Dan Abnett and Nik Vincent. - Cold Trade: Rogue Trader Brielle Gerrit returns in a new story from Andy Hoare. Mixed up in an unpleasant business deal on the backwater world of Quag, Brielle must resort to extreme measures to get out of trouble – deadly trouble. - The Problem of Three-Toll Bridge: An Altdorf student is dead after a reckless duel. An Altdorf student is dead after a reckless duel and his killer, young agitator Felix Jaeger, faces execution... Can Zavant Konniger get to the bottom of the affair? A new Zavant tale from Josh Reynolds. - Pariah - An Exclusive Extract: Walk the mysterious streets of Queen Mab and discover the secrets of the Maze Undue along with Alizebeth “Beta” Bequin in an exclusive extract from the first book in Dan Abnett’s Ravenor vs Eisenhorn trilogy. The dramatic conclusion of Gilead’s Curse, battles in a haunted hive city, on the war-torn world of Armageddon and on a planet ruled by the vicious Iron Warriors, and a rematch of the ultimate catfight. - Gilead’s Curse, Chapter 12: The riddle of the sands is revealed and Gilead and his small band of allies make their last stand. As the legions of the Tomb Kings close in, will any of them survive in this final instalment of the novel by Dan Abnett and Nik Vincent? - The Siege of Castellax: A clash of evils begins as the Iron Warriors factory world of Castellax is invaded by an ork Waaagh! An exclusive extract from C L Werner’s first Space Marine Battles novel. - Emperor’s Deliverance: On Armageddon, Sister Athena tends to the wounded and traumatised. But a conflict with the Marines Malevolent shows Athena that not all of the planet’s defenders believe in the Emperor’s Deliverance. A short story by Nick Kyme. - Fangs of the Asp: Long ago, Queen Neferata of Lahmia fought and killed her rival, and friend, Khalida. But the past never stays buried… The two queens clash again in a new Time of Legends short story by Josh Reynolds. J'ai une question HS les ebooks BL sont dans quel format ? pdf,epub ou autre ? Le numéro 26 a l'air pas mal, un extrait du siége de Castellax c'est bon ça. tioelscorpio a écrit: J'ai une question HS les ebooks BL sont dans quel format ? pdf,epub ou autre ? Un jour, au début de l'aventure de notre forum, j'ai posé la question, et j'ai obtenu la réponse suivante : epub et mobi, deux formats très répandus et compatibles avec la grande majorité des liseuses numériques du marché, y compris les Kindle d'Amazon par exemple. 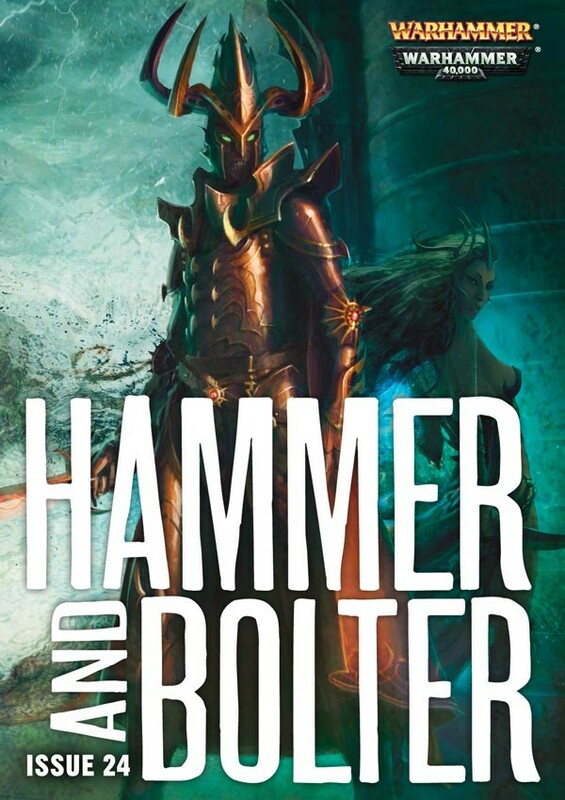 Ok merci, je m'en doutais mais j'étais pas sur, parce que j'ai vu un ebook sur kharn à 1€ The Weakness of others, sinon un hammer et bolter ça fait combien de pages environ ? tioelscorpio a écrit: sinon un hammer et bolter ça fait combien de pages environ ? J'ai pas la réponse, mais Solathen devrait pouvoir te répondre car il a commandé certains numéros. Ok merci, je verrai j'aime pas trop lire sur un écran mais ça peut être intéressant. Les derniers Hammer et Bolter que j'ai pris faisaient entre 90 et 138 pages. et je confirme le double format.